Since I've been running M$M, I've run into this scenario over and over from readers: They want to make more money in their chosen career path, which often means getting a post-graduate degree. But when they find out how much it costs to go that route…they second guess that decision. According to FinAid.org, a Master's degree can run you anywhere between $30,000 and $120,000. An MBA, more specifically, costs around $40,000 on average. So what the heck are you supposed to do? Do you take on more student loan debt, try your best to pay out of pocket…or just scrap the idea altogether and keep doing what you're doing? 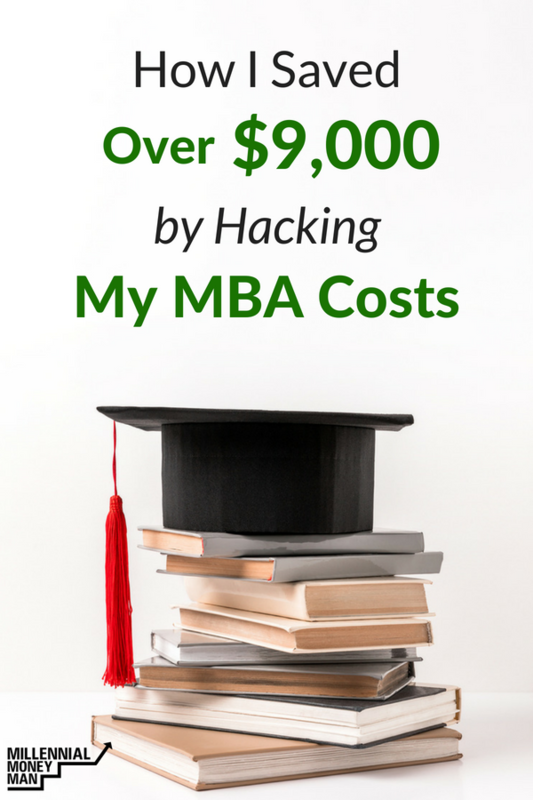 Fortunately, Jeff (a super-active reader in the M$M community) is sharing the strategies he used to bring the cost of his MBA down to something more manageable. There's no silver bullet to this issue, unfortunately…but I think that his line of thinking was creative and strategic. I knew I wanted to do some sort of MBA before I even finished my undergraduate degree. Those factors considered, I still felt like it was something that I would benefit from as I grew in my career and started thinking of ways I could make it work. Still saddled with about $25,000 in student loan debt from my undergrad degree, I knew that a more prestigious program that required me to quit my full-time job wasn’t right for me. Not only would I have the price tag of the program, student loan payments and other living expenses to deal with, but I would also suffer the opportunity cost of not working from both the financial and professional experience perspective. I basically needed to find a way to get a semi-reputable degree for a rock bottom price, and that’s exactly what I did. I narrowed my search to in-state only schools to minimize potential costs. Thankfully, many in my state had won awards for the value they provided, had favorable reviews, offered solid networks made up of prior students, and boasted a respectable list of alumni. Some of those in-state programs even offered credit for similar courses that you may have taken during undergrad, and some offered credit for work experience. Using both attributes as the key criteria, I settled on an in-state program that offered courses online or in-person, extremely good course flexibility overall and allowed me to transfer in 4 courses (12 credits). Checkmate. With textbooks and additional costs (proctoring, etc.) considered, in addition to the base tuition and fees for the program, the turn-key price was going to be right at $24,000. Thankfully, the ability to transfer those courses was going to save $5,300 right out of the gate – so I would be on the hook for around $18,700. My employer at the time offered a tuition reimbursement program, and that was a huge input in my decision to start at the point I did. They offered $2,500 per calendar year, and I was determined to maximize the benefit, so I started out super slow. Taking my time meant I could stretch the benefit across as many years as possible, but sadly the plan had to adjust once I was laid off in a large corporate restructuring. The joke is on them, though, because I was able to snag around $4,600 across the two calendar years before that happened. I secured a new position with a new company quickly, but they, unfortunately, didn’t offer any tuition reimbursement. Given that I was already well into the program and didn’t want to stop, I pressed on while paying out of pocket. After a little over a year, I found an even better position with a third company that generously offered another $1,500 towards the last semester of my program. During the years I was getting tuition reimbursement from the first employer, I didn’t get the reimbursement check until after the semester was finished. To save from coming off the cash, I got credit cards with big intro offers to charge the semester’s balance to. Once I received my tuition reimbursement at end of the semester, I would pay off whatever balance was left. This, net of credit card transaction fees and accrued interest for the ~3-month gap, allowed me to cut another $2,200 off of the total. Payment plans didn’t exactly save me any money, but I feel like they deserve a very honorable mention. These plans were key in keeping things moving during the time I had no tuition reimbursement flowing in, and didn’t have the extra cash to spare otherwise. With no credit check, interest, and only a $20 dollar per semester fee I was able to split the balance into anywhere from 3-5 payments per semester. This allowed me to continue my progress on a cash-flow basis, as opposed to taking out any new loans. Even when quoting for used textbooks where possible, each class requiring a textbook (or textbooks) came with an average bill of around $200 from the university bookstore. For books that I didn’t think I would want or need down the road, I used Amazon to rent them as opposed to buying them. Most of the time, doing so saved me as much as half of the cost! No matter if I thought I might want to rent or buy a particular book, I always took the ISBN number and went to Google. A few times, I got really lucky and found the book for WAY less than average from a random supplier in a ‘like new’ condition. I would use it all semester, take good care of it, and sell it for more money than I paid for it on a different site. All said these techniques saved me a combined $9,100 on my MBA. Pairing that total with the amount of money I was able to save with transfer credits, I saved a grand total of $14,400 on the cost of the MBA. This resulted in a 60% discount on the overall program cost and a total out of pocket of around $9,600. Keeping the costs low became a game and a driving factor to help keep me sane. Not only did I want to finish the program with a favorable outcome, but also wanted to see how cheaply I could do it for. So often you hear about the debt and sacrifice that the dream of going to/ going back to school can bring along with it. Everyone’s situation is different, but it is my hope that this story helps others to realize that there can be so many different ways to break through the price barriers that come with starting or continuing education – without taking on massive loans. Is getting an MBA worth it or no? I think it really depends on your goals and your job field! Plus if you’re open to doing an online vs in person program, I think that’s another great way to save money. I work at a state University and we have an online and a hybrid MBA program and it’s way cheaper than some other programs. When I was looking for a program (my Master’s is not an MBA), I went online to save money and actually went with the cheapest program that I could find with a good reputation. It was actually cheaper for me to go with a state school from a different state than it was to go with a state school in my home state. That being said, I don’t know if I could do it all over again that I would get an advanced degree. I think a Master’s degree is a sizable investment and unless it can really provide a big bump or you need it to get into your field, it’s not necessarily worth it. I’m currently looking at getting a dual master’s in City Planning and Business. I really appreciated the hacks that he had. In-state tuition is key to keeping costs low. My husband (he’s going for his MSW) and I are actually looking at moving to a new state, establishing residency there, and then attending a very good (but in-state, so cheap) school. That’s what my mom did, too. When she went back for her second masters, and now her Ph.D. It’s a slightly weird hack, but it’s saved my mom a ton of money in the meantime. Good luck with your search, Moriah! Worth noting – if you do go the residency in a new state route and don’t want to stay long term, I definitely recommend looking closely at the school’s grace periods. What i mean is, schools offer a certain window of time where you’ll continue to receive in-state rates even after moving out of state. For me, I left the state my school is in and continued to receive in-state rates for an entire year.